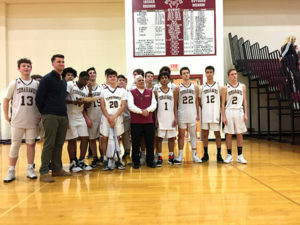 The Algonquin JV basketball team poses after capping off their undefeated 2019 campaign with a win over St. John’s High School. He found himself asking questions like that a lot in the now complete 2018-2019 winter sports season. That’s because, as much as the team he coached did not, on paper, look like one that could knock off some the best JV squads in the state, that’s exactly what it did on route to a rare undefeated season. A disparity in athleticism certainly contributed to Algonquin’s underdog identity this winter. But it was not the only such quality. On top of that, the team played what coach Bertonazzi called their toughest schedule in years, facing private school titan St. John’s twice and adding matchups against similar giants like Lowell, Andover and Catholic Memorial High School. They also did so, especially in the second half of the season, without three of their star players, who moved to the varsity unit mid-year. Finally, they capped all of that off with a self-diagnosed weak three-point shooting game. Their response to an often lacking perimeter attack was doubling down in practice on their defensive game. Bertonazzi describes his team’s practices this winter as physical, and touted his players’ ability to block shots, stall opponents’ drives to the basket, and their strong play off the backboard. By nature of effectively being a farm team for their school’s similarly dominant varsity program, the JV Tomahawk team lost stars like point guard Pat Freeman and forward Todd Brogner just as those players began to anchor the team. Particularly with Freeman gone, Bertonazzi said his team had to slow their offense down, learning to score by leveraging their size advantage rather than the speed advantage Freeman gave them on the fast break. Obviously able to make those adjustments and keep winning, Bertonazzi finds a silver lining in losing his stars. “What it did was it opened up more playing time for more kids so that, now, we’re hopefully able to develop more kids that can play in this system next year at the varsity level,” he said. After the season he and his players just completed, it is that future that Bertonazzi looks forward to. And, while he is not sure if he will return to coach next winter after more than 25 years on the job, he is sure that future for the program is bright.